It's taken me a couple of days to write this up - largely due to the fact that I've struggled to get a handle on my response to it. 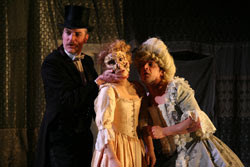 Taking the form of a 19th century 'freakshow' but replacing physical grotesques with emotional traumas, Headlong and Nuffield Theatre's production looks sumptuous, but I found its delight in amusing the audience with 'gross out' humour deeply depressing. In fact, my initial comment to Waldorf on leaving the show was that I was unsure if I was more disappointed in the production or the fact that much of the Citizens audience seemed so amused by it. One of the reasons I was so frustrated by the humour, is that underneath all the absurdity, blood and vomit each of the three tales has the potential to be genuinely touching. But despite the universally strong performances from Gant and his troupe (Simon Kunz, Emma Handy, Paul Barnhill & Sam Cox) I think much of the beauty and depth here is lost amongst the audience's gasps and groans. What's also lost is the sense of accusation that seems inherent as the play progresses. The players debate amongst themselves as to what audiences want (and deserve) to see and while that of course remains a question for theatre I felt it required a more pointed nudge in the direction of the current state of television and "Reality" shows in particular. And my confused attitude towards the show continues right to the end and its final 'reveal'. While I (and Waldorf) found it overly signposted there was clearly a good proportion of the audience taken by surprise, so I'm entirely unsure as to where to direct my frustration on that front. While I don't think I can say that I enjoyed the show, I was always interested in it - and I guess sometimes that's more important. Edward Gant's Amazing Feats of Loneliness runs at the Citizens until Saturday 21st March and then plays Clwyd Theatr, Cymru and Soho Theatre London.